The new officer team includes Josie Patrick, secretary; Colton Beatty, student adviser; Austin Cool, sentinel; Caroline Kress, treasurer; Walker Lindemuth, president; Kim Fourman, reporter; and Jacob Winterrowd, vice president. The Honorary Degree recipients included Sandy Layman, James and Jeanette Weimer. 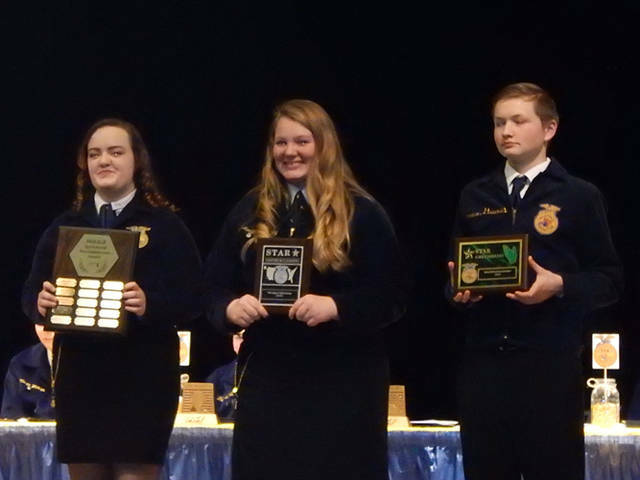 The Star Chapter Award winners included Dekalb Accomplishment Award winner Elisabeth Williams, Star in Ag Placement winner Morgan Hissong and Star Greenhand winner Mitchell Schmitmeyer. 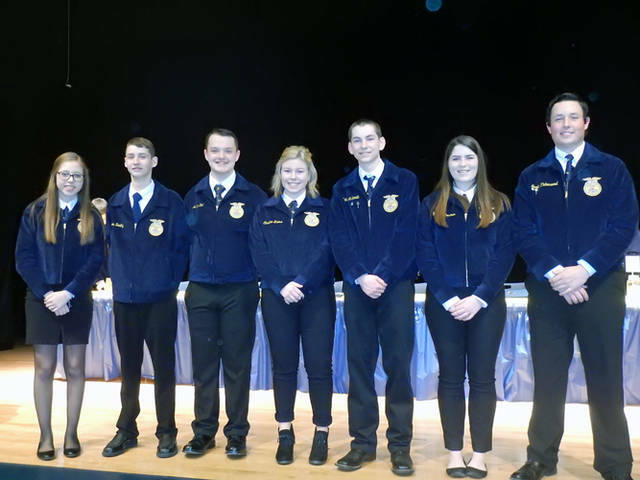 PITSBURG – The Franklin Monroe FFA Chapter celebrated its many accomplishments, both as a chapter and by its individual members, during the Annual Parent Member FFA Banquet held on March 19. Approximately 200 members, parents and guests attended the evening held at Franklin Monroe High School. Special guest speakers for the banquet were Superintendent Jeremy Pequignot and John Williams from Franklin Monroe FFA Boosters. Three members received Awards. Morgan Hissong received the Star in Ag. Placement Award, Mitchell Schmitmeyer received Star Greenhand Award, and Elisabeth Williams received the Dekalb Ag Accomplishment Award. The local chapter awarded honorary membership. The Honorary Chapter Degrees was presented to James and Jeanette Weimer, and Sandy Layman. The other awards and recognition presented throughout the evening included top citrus sellers to Elisabeth Williams with $2,981, Morgan Hissong with $1,760 and Clem Montgomery with $1,406. Other fruit sales award winners with sales of $300 of citrus were Cavin Baker, Morgan Baker, Cameron Barga, Colton Beatty, Austin Cool, Emma Fisher, Kimberly Fourman, Walker Lindemuth, Katie Ressler, Parker Schaar, Mitchell Schmitmeyer, Garrison Warner and Jacob Winterrowd. The chapter reached total sales of $16,000. Judging contest recognition certificates were given to the rural soils team of Morgan Hissong, Elisabeth Williams, Walker Lindemuth and Jacob Winterrowd; urban soils teamof Zach Little, Mason Garber, Colton Beatty and Brendan Wray; the agricultural and industrial diagnostics judging team of Walker Lindemuth, Jacob Winterrowd, Brendan Wray and Clem Montgomery; the parliamentary procedure chapter team of Morgan Hissong, Elisabeth Williams, Walker Lindemuth and Jacob Winterrowd. The chapter also recognized 20 members for outstanding SAE projects. Receiving chapter proficiency awards were Elisabeth Williams, ag. Communications placement and swine production placement; Morgan Hissong, ag. sales placement; Walker Lindemuth, swine production entrepreneurship and oil crop production; Jacob Winterrowd, landscape design and maintenance placement; Jake Armstrong, landscape design and maintenance entrepreneurship; Michael Buteau, outdoor recreation placement; Parker Schaar, outdoor recreation entrepreneurship; Raegan Warner, vegetable crop production entrepreneurship; Garrison Warner, diversified crop production placement; Mitchell Schmitmeyer, ag. design and fabrication placement; Bradley Rumble, ag. design and fabrication entrepreneurship; Colton Beatty, food science placement; Brendan Wray, specialty crop production placement; Dean Sease, specialty crop production entrepreneurship; Kaden Spirito, construction maintenance and repair placement; Matthew Brookey, ag. maintenance and repair entrepreneurship; Clem Montgomery, ag. maintenance and repair placement; and Morgan Baker, poultry production entrepreneurship. The 2019-20 Franklin Monroe-MVCTC FFA officers also were installed at the banquet. The new officer include Walker Lindemuth, president; Jacob Winterrowd, vice president; Josie Patrick, secretary; Caroline Kress, treasurer; Kimberly Fourman, reporter; Austin Cool, sentinel; Colton Beatty, student adviser; and Kevin Bergman, adviser. 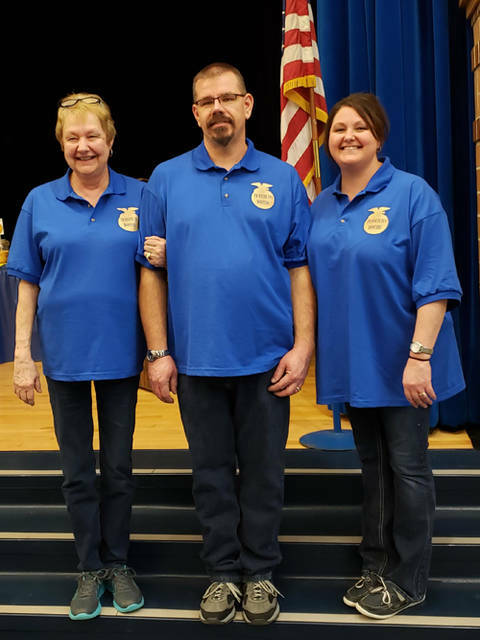 At the conclusion of the business meeting, the Franklin Monroe FFA Boosters announced the winners of their annual silent auction and the enlisted the help of Ron Crist with the annual pie auction. Both of these activities raised money for the Boosters that will go toward assisting the FFA members in upcoming events and activities. The Boosters thanked all of the community members who donated or purchased items at the event.